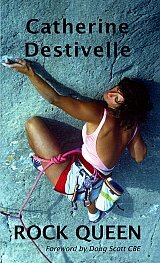 In English at last, Rock Queen, the autobiography from world famous award winning French climber Catherine Destivelle is full of Gallic charm - the drama and wit of her writing show why she took the climbing and media worlds by storm. In 1992 she became the first woman to complete a solo ascent of the Eiger's north face. She completed the climb in winter in 17 hours. Her other notable climbs include the Bonatti Route on the north face of the Matterhorn and the southwest pillar of the Aiguille du Dru (the Bonatti Pillar). The book was first published in Paris by Flammarion with the title 'Ascensions'. This is the first translation of Catherine's story into English and includes a foreword by Doug Scott, CBE, and an introduction by cameraman, writer and climber Jim Curran.